How can you help me become an Evangelist and help women who are crying out for hope in the same or a similar situation He’s helping me come through? Women just like you are reaching out and are responding to the cries He hears. The share praise reports of how the Lord is using them, leading them, to the women who are desperate for hope. Follow these inspirational stories Evangelist# Evangelismo# and share your own —inspire other women who can ‘Go into all the world and share the Good News to everyone.’” (Mark 16:15 NLT) since it was the last thing He told us to do in order to carry on for Him. #2 Get Ready, Be Prepared! We used to encourage women ordering our Hope Cards or print and cut them up to pass out. But now, He's shown us an easier way. When you hear someone speaking about marriage crisis, or what He’s brought you through, just say, “Here, I know something that could help” and then open your phone to show them HopeAtLast.com that you've bookmarked. Better yet, create an app. And, if your ministry is geared more towards Finding Love At Last, do the same thing but with LoveAtLast.ORG instead. Never before has it been possible to GO into ALL the nations been as easy as sitting at your laptop and looking for women who are crying out for help in their marriages. Where you will EASILY find these women is on Prayer Sites! 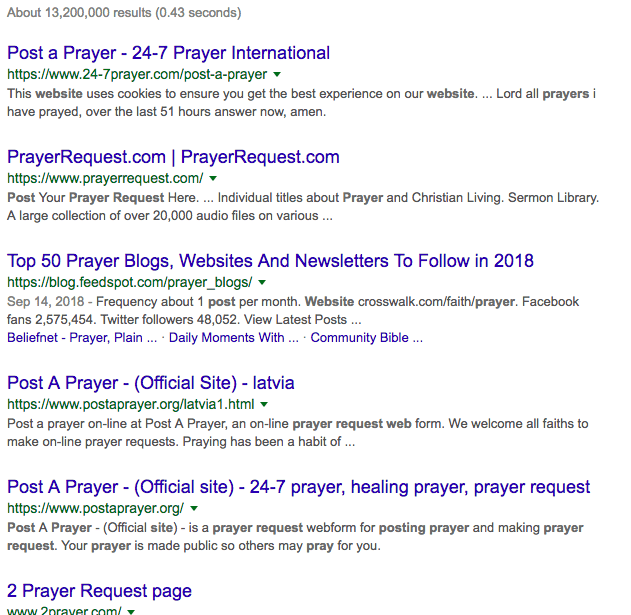 You can find women who are crying out for help by going to any search engine, like Google, you can type in “prayer posting website” and a full list will show up, actually PAGES of sites in two columns! Ask Him to lead you to other sites, then share new sites you find in your praise report to encourage fellow brides to join you. Does this really help anyone? Do you have results? Once again, take a moment to become inspired by reading different blog posts for our #evangelist and Evangelismo# to see how you can help bring peace and joy to the lives of women around the world! First, there are women who are very angry and may not be open to wanting help. You want to look for women who are broken, desperate and are interested in help—not a contentious woman who is only there to vent and shame their husbands. However, if this was where you were when you found RMIEW and you sense this is who He is calling you to minister to, then follow His lead. Nevertheless, there will be many women, especially contentious women, who may write back wanting to know more, if so, then send them to HopeAtLast.com and let them know they can fill out a Marriage Evaluation Form and get all the necessary resources for FREE. Nevertheless, we want you to be careful and watch out—if you get pulled into a discussion, you may not give them what they “want” to hear and often it could turn into a form of counseling where they will therefore never meet the Mighty Counselor. Additionally, we want you to be careful and watch out—if you get pulled into a discussion, you may not give them what they “want” to hear and often it could turn into a form of counseling where they will therefore never meet the Mighty Counselor. If you don’t have your BNN “Brand New Name” please CLICK HERE to discover the BNN “Brand New Name” He has for you, which is what you will want to use when submitting a Praise Reports and sowing Hope Online. Unfortunately, most women who fill out the MEQ just want to vent their anger or talk about their problems but never discover anything that will really help them. So again, be sure to send them to HopeAtLast.com so they can fill out a Marriage Evaluation Form to be given the Free resources (simply copy and paste the statement above). We also want you to be careful how much you READ in each post. Sadly some women share things that should never be shared with anyone, so just skim over the posts, and ask the Lord to lead you to whom He wants to reach out and help. If you read only far enough to see they need Marriage Help and then stop reading then post your reply, you'll protect your mind and heart from details that can interfere with your own restoration. * Also should you read a post from a man, both the webpages (MarriageHelpOnline.com and HopeAtLast.com) have help for men too. ** When you do see a post from a man, be extra careful that you do NOT post your name and that the site does NOT include your email address. “Be of sober [clear thinking] spirit, be on the alert. Your adversary, the devil, prowls around like a roaring lion, seeking someone to devour.” 1 Peter 5:8. Why a BNN “Brand New Name”? Using your BNN allows you to turn your focus from yourself, and onto others. So, as an Evangelist, you’ve traveled far enough along your Restoration Journey to the point that you’ve been spiritually healed, sufficiently trained and now your purpose and call on your life are to help other women, rather than yourself. Gone will be the days when you used to brag or envy or talk about nonsense, instead, having a BNN will help you post Prayer and help you minister to other women. However, this must be done, discreetly, by using a BNN, as a new wiser woman! Just as God changed Sarai to Sarah, Abram to Abraham, Simon to Peter, you too will be given a new name that will allow you to be transparent and real, without bringing shame to your family or attention on yourself. Would finding a name help you start your ministry? Often Erin says He gives her the name of the book, like Poverty Mentality or Moving Mountains and even How God Can and Will Restore Your Marriage which is what she would say when she met women—long before He restored her marriage! If you’ve been submitting praise reports, praise when overcoming hurdles (even hurdles not yet listed), or your restored marriage testimony and it’s been used in our Encourager blog, then you can share your unique tag that allows women to hear your testimony! As an example, here is a tag for one of our translators, Poppy, who has been ministering to other women. When she gives a woman one of our Hope Cards: HopeAtLast.org or a LoveAtLast.org Hope Card, she writes this on the back. When you post a prayer on prayer sites. When you submit a Praise Report regarding your evangelism fruits—in order to encourage other women to join and become an Evangelist. Whenever He leads you to use it. And to keep your family safe and protected, we ask that you PLEASE be sure to always use your BNN and the state when posting a prayer on a prayer site or submitting a Praise Report as you move forward. NOTE: Sometimes a Prayer Site will ask you to sign up, so please sign up, BUT be sure you remember to use your BNN and your new BNN Gmail address that has your P31PP (Proverbs 31 Profile Picture) and new BNN@Gmail account. Then EACH WEEK you’re actively evangelizing, we ask that you submit a WEEKLY PRAISE REPORT in order for us to know you’re active and also to share with other evangelists so together you can reach more hurting women. As we said before, once you begin sharing the Good News as an evangelist we'd like you to encourage MORE women to join you as an evangelist, by submitting a PR (praise report): either a longer PR for the Encourager or a shorter 50 Word PR sharing what you found and who you've helped! If you run into someone who tries to argue or dispute anything, remember to remain silent. Simply say nothing, just walk away just as Jesus explains in Matthew 10:14 by going to a new Prayer Site.